An evening of Visual Arts, Gallery Openings and More! 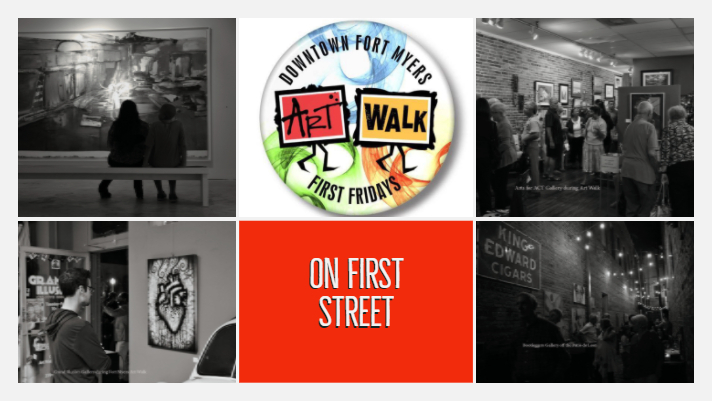 On the First Friday of each month from 6-10 pm over twelve galleries invite locals and visitors to a self-guided walking tour throughout the Downtown Fort Myers River District core. Art enthusiasts can "Meet the Artists" at most of the art galleries and enjoy live art demonstrations and art vendors on First Street from Jackson Street to Monroe Street. The Fort Myers Art Walk was organized in October 2008 by Greg Knevevich, Claudia Goode, Andy Howl, Jamie Kuser, Terry Tincher, David Acevedo, Xavier Brignoni, and Jim Griffith (amoung others) to unify the downtown Fort Myers art galleries into a singular active and vocal organization that helps the River District be a "Must See" destination spot and a point of interest for businesses both old and new. Many of the founding members have moved on but their hearts are filled with love for this event and the River District.